Web 2.0 has certainly made a significant impact on the ways we now create, manage and exchange information and knowledge. Collaboration is indeed the corner stone for real time communications within personal, academic and business arenas while using web 2.0 (Cloud) applications. We have simply been given much more flexibility through the use of cloud computing. Regarding Visual mapping; cloud collaboration has exponentially increased the potentials for being more effective and productive. The cloud can become a repository (Data bank) for storing and sharing much of your information and knowledge, and you also have control over who gets to access your information too. Less travelling to meet clients, your web space becomes a virtual office and classroom where you can operate, collaborate and present with ease; as long as you have web access. There’s a recent interesting trend coming from web 2.0 visual mapping apps. They are now moving towards offering desktop versions of their apps, so desktop computing isn’t dead yet. We were recently given access to Comapping by Michael Pliskin Director of R&D. Comapping is both a web and desktop based information management app that expresses a left to right format defined as visual mapping. The desktop application seamlessly synchronizes with the web based tool. During the summer of 2006 Comapping was born through a joint venture between Area9 in Denmark and Lanit-Tercom in Russia. These two organizations initially developed and used Comapping as an internal organization wide communication tool. They were frustrated with limitations that traditional mind mapping software posed. Soon realizing they were not alone while facing similar limitations with incumbent mind mapping software applications; Comapping was further developed for wider commercial use. It’s an awesome information mapping/management tool that enables you to collaborate with absolute ease, and it’s extremely fast. The developers have crafted a new and expressive category of information mapping that is independent of the Mind mapping genre. The Comap, Comapping and Comapper shall without a doubt, be definitions associated with forward thinking information management. Using Comapping has exponentially enhanced and improved our time and project management, to the point of having more clarity that equates to monetizing other more important aspects of our consulting work. Simply put, Comapping has; and continues to transform our information management capabilities. In our opinion Comapping has a powerful advantage over mind mapping apps, due to the left to right format and the top down logical process approach of this format. Project managers will most certainly feel comfortable with Comapping, as shall Business System managers who use the ISO 9001 standards. The left to right format, when mapping expresses a very comfortable and logical feel to Comapping. Asger Ottar Alstrup, CEO and Board Member of Comapping developed the unique auto-collapsing algorithm that optimizes use of often scarce computer screen real estate while mapping. The animated look to Comapping is very comfortable and pleasing to the eye. Navigation throughout a map while presenting information to colleagues and clients is one of the great strengths of Comapping. Real time collaboration is indeed a notable strength of Comapping. You will find it easy to invite a colleague into your mind map and give them permission to read or edit your map. While collaborating on the map, you can view where your colleague is and what part of the map they are editing. You can also use a chat window to communicate during the session. The experience of co-editing the map was fast and flawless. One of our top features of Comapping is the ability to easily publish your Comaps to you blog or web site by simply copying an embed code. With the recent addition of the Comapping desktop application, and its strong import and export features, Comapping is a strong information mapping tool for your collaboration needs. The desktop version is a clone to the online version, enabling you to work off line when required. Once you have created your mind map using the desktop version of Comapping you can save it to your online account and then access it through your browser. Comapping gives you lots of options if you would like to Export your mind maps to other applications. We found the no nonsense approach to mapping information while creating, managing and exchanging relevant business information was performed with ease. The learning curve was so short; we were up and running with Comapping within 10 minutes. Comapping is continuously being developed, therefore the user can have confidence the developers listen to the voice of the user. Expect a great future from Comapping. The Personal, Academic and Business application of Comapping is very evident, and we encourage you to download, use and purchase this excellent information management tool. It is available in two formats; desktop and web editions. Visit www.comapping.com for more information. Below is the Comapping welcome map; to navigate the map, choose a topic and press the tab key. I am absolutely amazed at the lack of use, ignorance and even disregard of probably the most effective root cause process freely available. It’s the “Interrogatives” of course; and they’re very rarely openly used out with academia, and even at that, they are hardly ever pushed as being the foundation for effective root-cause analysis. If at all we are to see a shift in societal perceptions regarding information management and communication, I firmly believe we have to get back to basics and start with the interrogatives. 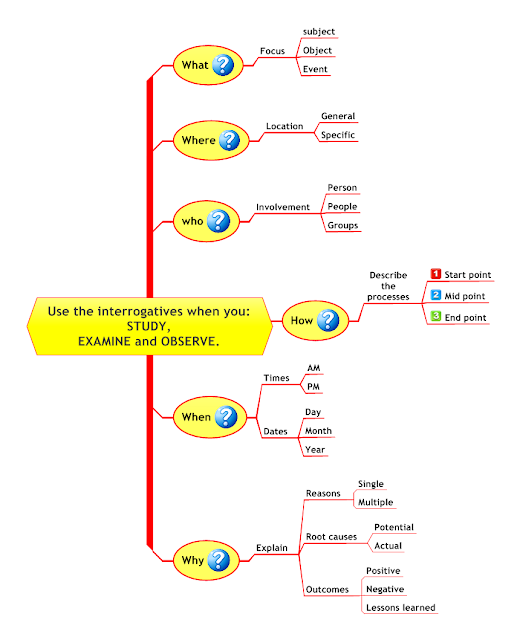 Just think about it for a moment; you see a situation, event or are in a meeting with your colleagues, and while you don’t realize it, you are analyzing it all using the interrogatives as part of your internal schema. Yes, we humans use the interrogatives naturally, yet we have either willingly or unwittingly been taught or conditioned into disregarding them as useless. We have indeed relied on technology to draw us to a place of more conditioning, and reliance upon tools that are out with our internal and natural abilities. The paradox is the natural ability can and is being rediscovered in and through the tools, methods and mindset of software Visual mapping. So, give it a try, use the interrogatives and you’ll certainly regain your basic intuitive ability to analyze and root-cause any issue associated with your personal, academic and business environment. I am motivated to post this very short commentary based on what I have just watched on BBC Canada. The program was a documentary regarding Norway’s laws, designating gender equality within all aspects of society. The focus was aimed at women sitting as board members and directors. Taking this facet of Norwegian society into consideration as a professional Visual mapper; I have had one of those epiphany moments where I have abruptly realized there are very few female professional visual mappers. The potential reality though is that, I may indeed be looking for professional female visual mappers; they’re there but I just don’t see them because of my male dominant conditioning. From what I gather from the documentary, It has been measured that gender balanced teams perform more effectively than gender dominant teams. The findings were indeed very revealing, and I wanted to open up a discussion regarding the absolute need for finding, dialoguing with and creating business relationships with professional Visual mapping women. Taking into consideration that a few of my colleagues and I are now in the process of founding a Visual Mapping Body of Knowledge (VMBOK), and also acknowledging the Visual mapping arena may indeed be male dominated. This is an invitation to our female colleagues who are professional Visual mappers to connect with us, with a view to involvement within the VMBOK. Time for a Visual Mapping Body of Knowledge? Wallace Tait is a professional visual mapping consultant based in the Canadian Province of Ontario. He is the co-author of the e-book Visual Mapping: “A Systematic Framework for Business Improvement” and founder of the Visualmapper consultancy. He is an expert on the effective creation, management and presentation of graphically mapped information systems. Wallace recently approached me to discuss the idea of creating a Visual Mapping Body of Knowledge (VMBOK), to provide a commonly-accepted collection of principles and best practices relating directly to Mind, Visual and Knowledge mapping tools, methods and mindset. Frey: What are the challenges facing visual mapping today? Tait: Before I address this question, I’d like to clarify the definition of visual mapping, because that will frame our discussion. Visual mapping includes but is not limited to mind mapping, concept mapping, flow charting, argument mapping and many newer approaches to information management. It may be a single or multiple graphical formats used to create, manage and exchange information. I fully agree with John’s statement and would further state that knowledge is only significant by the relevancy of contextual information. The overwhelming challenge facing visual mapping products today is the contextual management of relevant information that builds knowledge. For further information relating to contextual information management, I suggest you visit www.contextdiscovery.com. There you’ll find Context Organizer, a standalone information management product that’s also an add-in for Mind Manager. This excellent product will open up a whole new understanding of contextual information management to you. There are other challenges of course, but I have merely focused in on the contextual issue, and I know we’ll see some very interesting developments regarding the integration of contextual engines to future information management products. The challenge is no longer all about mind mapping; it’s much more about information management and knowledge governance. A few of the mainstream mapping products such as Personal Brain, TopicScape and Mindsystems Amode have moved in the direction of knowledge mapping, breaking away from the constraints of forced non-linear formats and breaking into the real need for visual mappers to be database capable. Visual mappers however need more than a mind map view. Visual mapping products have certainly come a long way in developing a user environment where information can be expressed in multiple graphical formats. So, there are clear demarcation lines between the seemingly independent Mind, Visual and Knowledge mapping arenas. It must be said though, in view of process and systems thinking; these three arenas are indeed interdependent. Integrating linear and non-linear formats enables these two opposites to be a part of a whole-brained approach to information management. I have found that data, information and knowledge can embody both linear and non-linear characteristics. Those who have grasped the fundamentals of information management within a visual mapping environment acknowledge the need to converge the linear and non-linear perspectives. Frey: You’re a big fan of author Dan Pink’s emphasis on “whole brained” thinking. Why is that important today? The book explains how we’ve been dumbed down by corporate decisions to outsource left-brained activities. Pink’s premise is that we are becoming either left- or right-oriented in regard to information and knowledge, and that we need to become whole-brained thinkers again to be more successful in the future. He really has an informed angle on the lack of whole-brained thinking within academia and business. I believe whole-brained thinking is on its way to being realized, in part through the growth of visual mapping. Frey: You’ve identified a problem with recent college graduates and the ways in which they’re taught to think. What’s missing, and how does that put them at a disadvantage in today’s business world? Tait: Industry and corporate business must see the bigger picture regarding graduates released into the world of industry and business. Have you ever been in this situation? You’ve just hired new graduates, and you then have to spend a small fortune to train them to understand your business operating system? Graduates present themselves to industry and corporate business, thinking they are fully able to grasp business systems, as if one size fits all, and they’re so wrong in many cases. Graduates are not necessarily falling short; academia just hasn’t prepared them to fully grasp the reality of integrated linear/non-linear information management. In effect, we have to help the new graduates to unlearn much of what they have learned. There are always exceptions to the rule, but I have found that a majority of graduates are ill-equipped to handle non-linear systems, or even understand the implications of integrating linear and non-linear regarding business processes and systems. Frey: What are some examples of non-linear systems? Tait: Two examples are software development (SD) and quality management systems (QMS). SD programmers are those who understand the integration of linear and non-linear. While a software product is being developed; data, codes and algorithms are commonly expressed in graphical formats that look and act like mind maps and concept maps. The end product in most cases is expressed as a linear software product in relation to the user interface, but all or most of the actions taken to execute the functions of the software, are performed below the surface as non-linear associations and actions. QMS is similar to the SD example. Business systems function with the use of processes (what’s) and procedures (how’s). Process maps, value stream maps and flow charts are very linear, but it is clear to business management that a QMS is made up of independent and interdependent links, associations and process that are non-linear in their operation, expression and nature. Frey: How will developing a Visual Mapping Body of Knowledge (VMBOK) help to solve this problem? Tait: The development of a VMBOK would help to initially define the mindset of visual mapping. It can be a place where businesspeople can find relevant academic information and knowledge about the expanding arena of visual mapping. Academia, in general, does a great job of teaching the regulated curriculum's. The issues are that the teaching facilities such as colleges and universities are constrained by established linear practices relating to information, knowledge, process and system. I believe there is a great gap (read chasm) between what academia produces and what industry and corporations require. I firmly believe that corporations should be proactively involved and supportive of the academic systems that produce the next generation of information managers. Working closely with each other is the key to creating curriculum's that speak to the issues and needs of today’s businesses. Organizations such as Motorola, IBM, GE, Toyota and others recognize the importance of integrating linear and non-linear processes into their management systems. Add in contextual relevancy and you have a sound foundation of definitions, processes, systems and practices that produce next-generation thought leaders. Frey: How can the Body of Knowledge help people who are already in the workplace and are struggling with today’s business challenges? Tait: I believe the tools and techniques of visual mapping can benefit any user exponentially. The challenge is to provide a knowledge base of best practices that will help users to realize bottom-line results – which is what matters to businesses, now more than ever. I firmly believe that the database of information contained within a visual mapping BOK will help individuals and companies to realize tangible results with it and therefore will help to drive greater acceptance of it in business applications. Frey: What are the benefits of having a body of knowledge in place? How can that lead to certification, for example? Tait: The information and practices submitted to a BOK may be vetted by recognized thought leaders and other contributors such as, professional consultants who work within the information management fields. This helps to ensure that it contains high-quality information and best practices that are agreed upon by experts in that field. That’s where its value comes from. 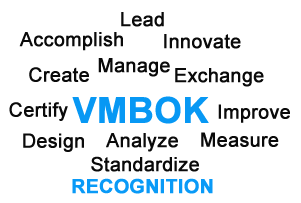 Those who are interested in obtaining a recognized and standardized certification to the VMBOK would benefit by way of membership to a Visual Mapping Institute (VMI). We have PhD’s, MBA’s, and other professional bodies that offer industry and corporate graduates the academic recognition they require to move forward with validated professional certification. There’s no reason why a BOK existing within a VMI shouldn’t work with academia and corporate to certify graduates who are required to be integrated thinkers and information managers with the skills to handle process and system more effectively. The role of a VMI would be similar to the roles of organizations such as the Project Management Institute (PMI) and the American Society of Quality (ASQ). These institutions interact with colleges and universities in offering a knowledge base contained within their respective BOKs. The information contained within a BOK is in and of itself a training and knowledge database, offering a potential self-directed teaching and learning process for graduates. Frey: Ultimately, how will a BOK help to drive change at the academic level? Tait: Such a BOK would be invaluable to academia and corporations when they see the bigger picture of integrated thinking, and decide to collaborate and contribute to the BOK and VMI. The drive for responsible change is equally divided between academia and business. Both groups need to work together to fully realize the benefits of whole-brained thinking that Dan Pink’s book, A Whole New Mind, envisions. Frey: How does the process work to create such a body of knowledge? What elements are needed? Tait: A Visual mapping Body of Knowledge (VMBOK), modelled on the Project Management (PM) BOK and American Society of Quality (ASQ) BOK may be ideal models for the framework of a VMBOK. I have recently viewed an excellent Wiki developed by Roy Grubb, who has vision to see that a BOK is indeed useful and needed to standardise for future use. IMO, I don’t see a Wiki (free for all approach) being the answer to the creation and further development of a VMBOK, Roy’s excellent work however, shows us that it’s already being done in the Wiki sense. For best results, I believe that the proposed Visual Mapping Body of Knowledge (VMBOK) should mirror the previously mentioned models of the PMBOK and ASQBOK. The information submission process to a VMBOK hasn’t been clearly defined and agreed upon by my colleagues and peers. I do, however, see this process as being confirmed by consensus, and I recommend that we benchmark the two institutions I mentioned earlier to standardize the submission process. Frey: Why do we need to do this now? Tait: If you keep doing what you’re doing, you’ll keep getting what you’re getting. I firmly believe a VMBOK and VMI is a winner for academia, industry and corporate business. There’s absolutely no loss in creating opportunities for visual thinkers to be formally recognized as whole-brained thinkers. They will become the thought leaders and motivators of the future. I believe it’s critical that we get moving on this BOK now. Many of my professional colleagues such as Philippe Boukobza, Chuck Frey, Olin Reams, Brian Friedlander and many others are ready to get working on this initiative, so let’s get started! How do you believe you can contribute? Let me know.